A season ago, the Chicago Bears owned the league’s 10th-best coverage grade at 90.4. And a season later, they have been rewarded for keeping the core of that secondary intact. 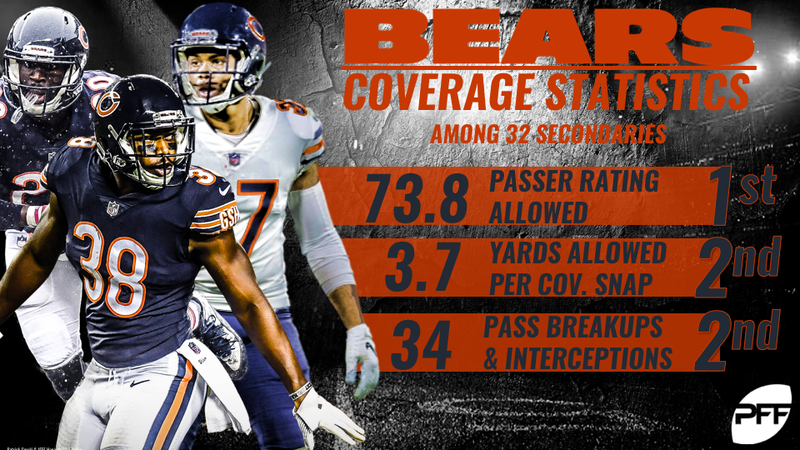 A league-leading 93.2 coverage grade has propelled the Bears vaunted defensive backs to stardom — a unit that deserves recognition as the NFL’s best. The combination of cornerbacks Kyle Fuller, Prince Amukamara and Bryce Callahan in addition to safeties Adrian Amos Jr. and Eddie Jackson has proven to be a lethal grouping through 10 weeks of play. A combined 67.0 passer rating allowed when targeted among those five players heavily trumps the NFL average of 93.3. And it would be easy to attribute that stellar play to a free agent signing or a talented rookie — but this is the same secondary from a team that went 5-11 in 2017. Now, they have a potent offense that can back up their stellar play. That stellar play is most visible in the Bears’ league-leading 16 interceptions, but less apparent in the intricacies of pass coverage. For instance, on passes 20 or more yards downfield, the Bears are allowing a second-best 48.7 passer rating, including just nine completions on 38 attempts. Amukamara has been particularly impressive on those throws, allowing one completion on 10 targets for no touchdowns and two interceptions. That would be a passer rating of 0.0, one of only three cornerbacks this season at the same level. Opposite of Amukamara is Fuller, who is on pace for a career-best year. He’s already matched a career-high with four picks, but there’s more to his coverage than meets the eye. In 2017, he had 16 “impact plays” (plays when targeted that were graded 1.0 or above), second among cornerbacks. And this season, he hasn’t let up — his 10 “impact plays” are tied for first among corners. That has culminated into a grade of 87.6, which would shatter his 2017 mark of 77.0. In the slot resides a familiar face for Bears fans. Bryce Callahan may not be well known around the league, but ever since signing with the Bears as an undrafted free agent in 2015, he has improved to become one of the NFL’s best slot corners. He’s allowed just .64 yards per cover snap from the slot (t-4th) and has even begun commanding respect from opposing quarterbacks, with a fourth-best average of 8.7 cover snaps per target. Then, there’s the potent safety duo of Amos Jr. and Jackson. Both have been stout in coverage, but Jackson has shown a knack for run-stuffing in his second year. His 81.3 run defense grade is third-best among safeties. In coverage, Amos has allowed just 5.14 yards per reception, second to only to rookie standout Derwin James. When a team has multiple players with the level of potential that the Bears’ secondary had in 2017, a front office would be smart for keeping them together for more than a year. More often than not, teams are desperate to move on to someone else — but the Bears decided to build around their defensive playmakers rather than replace them. And now with quarterback Mitchell Trubisky leading an explosive offense, the Bears’ defensive backs are thriving. Opposing quarterbacks are already fearful of Khalil Mack off the edge — now with Amukamara and Fuller, among others, in lockdown coverage, not only will the Bears’ secondary be considered a top-unit, but the entire defense as well.